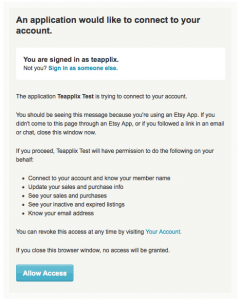 Teapplix supports order sync and listing sync with Etsy. We can automatically download orders from Etsy, upload tracking no. And we can also download listings from Etsy and update the listing inventory quantity. Next, you'll be redirected into your account Teapplix.com. If you've multiple accounts, you need to select which store should be linked. 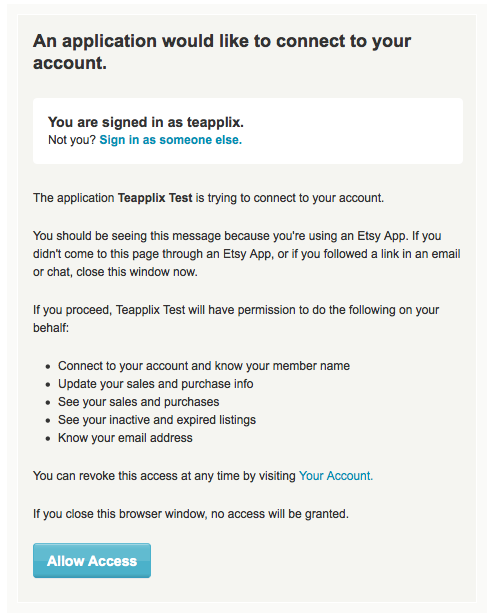 Important: It is very important to note that with Etsy, the items must be mapped in Teapplix because Etsy does not support SKUs. If you are listing item with variations, in order for Teapplix to update the quantity on each variation item, you need to enable quantity control properties of your product variations. Otherwise, Etsy would require all variations for the same listing to have the save quantity and cannot be updated individually. On Etsy, after you specified the variation for an item, check the boxes that apply to that item attribute and select Update, then enter the varied options in the Price, Quantity or SKU fields.